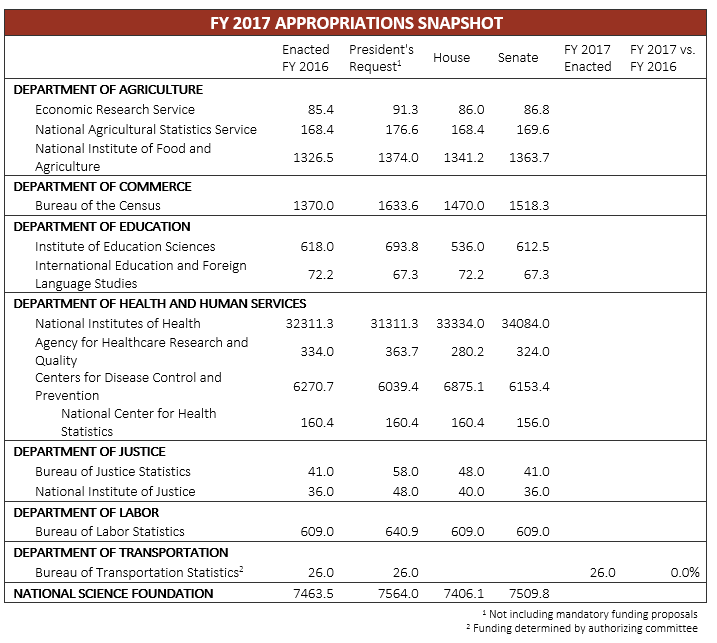 On April 21, the Senate Appropriations Committee approved the fiscal year (FY) 2017 Commerce, Justice, Science and Related Agencies (CJS) Appropriations Bill. This bill serves as the vehicle for annual appropriations for the National Science Foundation (NSF), Census Bureau, National Institute of Justice (NIJ), Bureau of Justice Statistics (BJS), and countless other federal departments and agencies. The next step for the CJS bill is consideration on the Senate floor, which has not yet been scheduled. The bill would provide NSF with a total budget of $7.5 billion in FY 2017, flat with the FY 2016 enacted level. Most notably the Senate bill does not include language singling out social science (or any other scientific disciplines) for cuts or preferential treatment, as we saw last year in the House bill. However, there is language calling on NSF to include criteria in its merit review process considering a project’s potential for advancing U.S. “national security and economic interests.” Further, NIJ and BJS would be held flat for another year at $36 million and $41 million, respectively. Finally, the Census Bureau would receive an increase, but not the amount requested by the Administration for the continued ramp up to the 2020 Decennial Census. Read on for COSSA’s full analysis. You can keep up-to-date on the status of FY 2017 funding for social science research agencies on the COSSA website.